We are internationally recognized scientists working side by side with M.S. and Ph.D. students to solve threats to the world’s food supply. We study ALL major groups of pathogens that cause diseases in plants —fungi, bacteria, viruses and nematodes using a variety of methods including genomics, proteomics, applied ecology, host-pathogen interactions. Fungi cause over 70% of all plant diseases. Not surprisingly, mycology is one of our strengths, and three-quarters of the faculty have research projects involving fungi. Mycologists at WSU address fundamental questions on fungal diversity, evolution, biology, and ecology. By gaining a better understanding of fungal pathogens, we can develop more effective and ecologically sound methods for controlling plant disease. 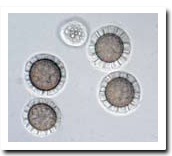 Did you know that bacteria can cause devastating plant diseases or can improve plant health? Phytobacteriologists use a suite of traditional physiological tools as well as modern culture-independent molecular genetic and genomic tools to investigate bacterial diseases of crops in Washington State. Beneficial bacteria can be useful in the control of plant diseases, such as root pathogens of small grains and canola, and can enhance productivity by providing novel abilities, such as the fixation of atmospheric nitrogen. Virologists, the ultimate “Microbe Hunters”, characterize and describe new viral pathogens infecting ornamentals, legumes, small grains, grapes and vegetable crops in Washington. We develop strategies for controlling viral plant pathogens, and are involved in identifying and preventing the introduction of exotic viruses infecting plant germplasm that may significantly impact bean, pea, chickpea and lentil production in Washington and the U.S.
Nematodes are small roundworms that can cause problems on a wide range of host plants and are difficult to control. Plant parasitic nematodes cause billions of dollars in crop losses globally every year. WSU nematologists want to know more about plant responses to nematode infections. They studying the molecular interactions between plants and nematodes in order to develop novel resistance mechanisms. 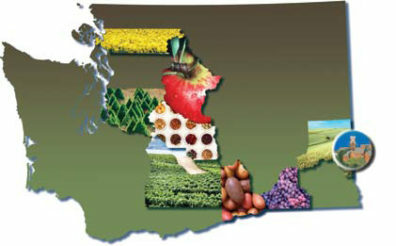 The top agricultural crops grown in Washington are apples, potatoes, wheat, cherries, pears, grapes, onions and hops. Washington State leads the U.S. in the production of red raspberries, hops, spearmint and peppermint oil, apples, sweet cherries, pears, and is second in asparagus, potatoes, onions and grapes. State and federal scientists housed in the Department of Plant Pathology work closely with breeders to develop new varieties of wheat and other small grains that are resistant to a wide range of fungal pathogens. These scientists are also looking at novel ways to control these devastating pathogens. The Pacific Northwest is one of the leading producers of food legumes (chickpeas, lentils, dried peas), an important source of protein for many people around the world. Plant pathologists at WSU work on Ascochyta blight, Sclerotinia, and other diseases that can cause devastating losses to these important crops. Late blight ravaged the potato crops of Ireland in the mid-1840s, and millions of Irish peasants were faced with the prospect of starvation or emigration to North America. Plant pathologists located in Pullman and Mt. Vernon look for better ways to predict outbreaks of this pathogen and improved methods for controlling it. Washington has emerged as one of the top wine regions in the world, with an ideal climate for the production of high quality wine grapes. The 475+ wineries in the state contribute $2.9 billion to the state economy. Plant pathologists located at the WSU Irrigated Agriculture Research and Extension in Prosser work with growers to minimize the impact of fungal and viral pathogens on wine and Concord grape production and quality. Postharvest rots of apples and pears cost growers millions of dollars in lost revenue annually. Plant pathologists in the department have identified new species of fungi responsible for postharvest rots in the state and are working on improved methods for controlling these pathogens. Sixty different vegetables can be grown in Washington, and 22 of these are grown commercially in the state . Fresh vegetables and vegetable seed from Washington are exported around the world. Research by plant pathologists at WSU-Mount Vernon’s Northwestern Washington Research & Extension Center have increased our understanding of the plant pathogens that infect vegetables, and lead to more effective disease management. Ornamental crops are an important aspect of Washington’s agriculture. Nursery and greenhouse production of cut flowers, bulbs, potted plants, conifers and broad-leaved evergreens is valued at over $250 million annually. Plant pathologists at the WSU Puyallup Research and Extension Center develop disease management strategies and provide information on plant pathogens to homeowners and commercial producers of ornamental crops. south of Seattle/Tacoma), and Prosser (southeast Washington, close to the Tri-Cities area). Our main campus is located in Pullman, in eastern Washington, in an area of the Pacific Northwest known as the Palouse. The Palouse region has rolling hills and fields bordering forested areas to the east and desert scablands to its west. Outdoor recreational opportunities abound: water sports, snow sports, rock climbing, camping, fishing and hiking are activities many of our students enjoy. Indoor recreation is offered at the new Student Recreation Center which was built in 2004 and contains something for everyone! For more information, visit their website. Moscow, Idaho is home to the University of Idaho and is a short 7 miles to the east of Pullman. The Rocky Mountain Research Station (USDA) is located in Moscow and some of our adjunct faculty and their graduate students perform research in that facility. The proximity allows students to draw on the wide-ranging expertise of faculty at both universities.